Sever disease is a self-limited condition; accordingly, no known complication exists from failure to make the correct diagnosis. 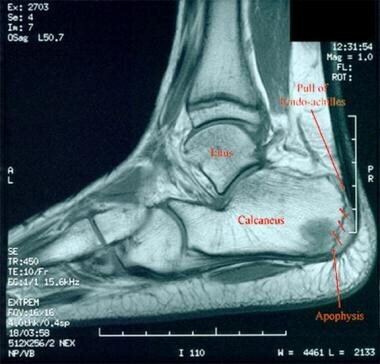 The calcaneal apophysis develops as an independent center of ossification (possibly multiple). It appears in boys aged 9-10 years and fuses by age 17 years; it appears in girls at slightly younger ages. During the rapid growth surrounding puberty, the apophyseal line appears to be weakened further because of increased fragile calcified cartilage. Microfractures are believed to occur because of shear stress leading to the normal progression of fracture healing. This theory explains the clinical picture and the radiographic appearance of resorption, fragmentation, and increased sclerosis leading to eventual union. The radiographs showing fragmentation of the apophysis are not diagnostic, because multiple centers of ossification may exist in the normal apophysis, as noted. However, the degree of involvement in children displaying the clinical symptoms of Sever disease appears to be more pronounced. In a study of 56 male students from a soccer academy, of whom 28 had Sever disease and 28 were healthy control subjects, findings suggested that higher heel plantar pressures under dynamic and static conditions were associated with Sever disease, though it was not established whether the elevated pressures predisposed to or resulted from the disease. Gastrocnemius ankle equinus also appeared to be a predisposing factor. The anatomy of the calcaneal apophysis lends to significant shear stress because of its vertical orientation and the direction of pull from the strong gastrocnemius-soleus muscle group (see the image below). Labeled MRI depicts the anatomy and mechanical forces responsible for the development of Sever disease (shear stress at the calcaneal apophysis). Sever disease is a relatively common problem in growing active children, though little in the way of exact incidence figures has been available. Wiegerinck et al, in a 2014 cross-sectional study described as the first report on the incidence of calcaneal apophysitis in the general population, examined the records of children aged 6-17 years who visited 34 general practices in the years 2008, 2009, and 2010. A total of 16,383 files were searched, and 61 children with this condition were diagnosed, for an incidence of 3.7 per 1000. Although no well-recognized, long-term sequelae of untreated Sever disease exist, this condition causes pain that can limit performance and participation in sports and, if left untreated, can significantly limit even simple activities of daily life. Sever JW. Apophysitis of the os calcis. N Y Med J. 1912. 95:1025-9. Sever JW. Apophysitis of the os calcis. Am J Orthop. 1917. 15:659. Smith JM, Varacallo M. Sever Disease. Treasure Island, FL: StatPearls; 2018. [Full Text]. Pappas AM. The osteochondroses. Pediatr Clin North Am. 1967 Aug. 14 (3):549-70. [Medline]. Katz JF. Nonarticular osteochondroses. Clin Orthop Relat Res. 1981 Jul-Aug. 158:70-6. [Medline]. Pizzutillo PD, Sullivan JA, Grana WA. Osteochondroses, Chapter in The Pediatric Athlete, American Academy of Orthopaedic Surgeons Seminar, Oklahoma City Oklahoma, November 1998. Roy DR. Accessory navicular and osteochondroses of the foot and ankle in the child and adolescent. Foot and Ankle Clinics. Philadelphia: WB Saunders; 1998. Scharfbillig RW, Jones S, Scutter SD. Sever's disease: what does the literature really tell us?. J Am Podiatr Med Assoc. 2008 May-Jun. 98 (3):212-23. [Medline]. Lau LL, Mahadev A, Hui JH. Common lower limb sport-related overuse injuries in young athletes. Ann Acad Med Singapore. 2008 Apr. 37 (4):315-9. [Medline]. Malanga GA, Ramirez-Del Toro JA. Common injuries of the foot and ankle in the child and adolescent athlete. Phys Med Rehabil Clin N Am. 2008 May. 19 (2):347-71, ix. [Medline]. Weiner DS, Morscher M, Dicintio MS. Calcaneal apophysitis: simple diagnosis, simpler treatment. J Fam Pract. 2007 May. 56 (5):352-5. [Medline]. Clemow C, Pope B, Woodall HE. Tools to speed your heel pain diagnosis. J Fam Pract. 2008 Nov. 57 (11):714-23. [Medline]. Irving DB, Cook JL, Young MA, Menz HB. Impact of chronic plantar heel pain on health-related quality of life. J Am Podiatr Med Assoc. 2008 Jul-Aug. 98 (4):283-9. [Medline]. Hendrix CL. Calcaneal apophysitis (Sever disease). Clin Podiatr Med Surg. 2005 Jan. 22 (1):55-62, vi. [Medline]. Turek SL. Orthopaedics: Principles and Their Application. Philadelphia: JB Lippincott; 1984. 1474. Becerro-de-Bengoa-Vallejo R, Losa-Iglesias ME, Rodriguez-Sanz D. Static and dynamic plantar pressures in children with and without sever disease: a case-control study. Phys Ther. 2014 Jun. 94 (6):818-26. [Medline]. Tu P, Bytomski JR. Diagnosis of heel pain. Am Fam Physician. 2011 Oct 15. 84 (8):909-16. [Medline]. Wiegerinck JI, Yntema C, Brouwer HJ, Struijs PA. Incidence of calcaneal apophysitis in the general population. Eur J Pediatr. 2014 May. 173 (5):677-9. [Medline]. Micheli LJ, Ireland ML. Prevention and management of calcaneal apophysitis in children: an overuse syndrome. J Pediatr Orthop. 1987 Jan-Feb. 7 (1):34-8. [Medline]. Tu P. Heel Pain: Diagnosis and Management. Am Fam Physician. 2018 Jan 15. 97 (2):86-93. [Medline]. Rachel JN, Williams JB, Sawyer JR, Warner WC, Kelly DM. Is radiographic evaluation necessary in children with a clinical diagnosis of calcaneal apophysitis (sever disease)?. J Pediatr Orthop. 2011 Jul-Aug. 31 (5):548-50. [Medline]. Brenner JS, American Academy of Pediatrics Council on Sports Medicine and Fitness. Overuse injuries, overtraining, and burnout in child and adolescent athletes. Pediatrics. 2007 Jun. 119 (6):1242-5. [Medline]. Wu M, Fallon R, Heyworth BE. Overuse Injuries in the Pediatric Population. Sports Med Arthrosc Rev. 2016 Dec. 24 (4):150-158. [Medline]. Perhamre S, Lundin F, Norlin R, Klässbo M. Sever's injury; treat it with a heel cup: a randomized, crossover study with two insole alternatives. Scand J Med Sci Sports. 2011 Dec. 21 (6):e42-7. [Medline]. Uvelli K, Neher JO, Safranek S. Treatment for Calcaneal Apophysitis. Am Fam Physician. 2017 Jul 15. 96 (2):126-127. [Medline]. [Full Text]. Sever disease. Lateral radiograph of foot in symptomatic 9-year-old male soccer player. Sclerosis is not diagnostic of Sever disease but is a characteristic radiographic finding. Transverse MRI of foot in symptomatic 11-year-old girl with heel pain showing osteomyelitis. Pain was increased with activity but more constant and with more associated night pain than expected with Sever disease. Treatment included surgical debridement and antibiotic therapy. Fast Five Quiz: What Do You Know About Carpal Tunnel Syndrome? Fast Five Quiz: How Much Do You Know About Knee Pain? Fast Five Quiz: How Much Do You Know About Psoriatic Arthritis? Labor Day Fast Five Quiz: Can You Help Curb the Cost of Occupational Illness and Injury?